What Kind Of Love is the fifth studio album from Danny And The Champions Of The World. Led by frontman Danny Wilson, the album is an exploration of love in many different forms set to Danny's unmistakable soulful country-tinged voice and is drenched in beautiful brass and pedal guitar throughout. Danny Wilson has always been one of the nation's most under-rated songwriters, whether it be with Grand Drive or this band he formed following their dissolution in the mid 2000s. The Champs, as they're known, have been a band in a state of constant flux, changing line-ups but without ever losing the ability to create perfectly crafted songs that touch the heart and soul of their listeners. What Kind Of Love is no exception to this. What's most striking about the record is its positivity throughout, most evident in the moments where love is working like that from the opening Clear Water where Danny exclaims "When life gets crazy, I see you" or where he's putting his arm round the shoulder of the subject of the song on Just Be Yourself, where he imparts sage advice to them to be true to themselves. The real message of the album comes on It'll Be Alright In The End where he points to the light at the end of the tunnel and the natural human instinct to adapt and survive. However, even when he's in more reflective mood on the self-explanatory This Is Not A Love Song and Can I Change My Mind, both of which deal with relationship breakdowns, there's an underlying feeling that everything will be alright in the end, such is the infectious energy that the music, Danny's intonation and the backing vocals that work with and also counter him. If you didn't listen to the words, you'd think this record was a celebration at these moments rather than picking over the bones. It's not all cut and dried though, as he ponders on the title track what the right kind of love is. It feels like it's a soul-baring, open and honest question he's asking, a trait that's reflected throughout his work with this band as well as Grand Drive. Danny writes and sings from the heart and this is why those that know his work immerse themselves in it so deeply. That's a theme that continues on Words On The Wind where he chooses the less obvious path to love "Sometimes you got to take the road less travelled and do what you got to do" before a guitar solo drops into a beautiful brass section. The music succeeds yet again here to uplift the listener and distract them from the travails of the subject matter. What Kind Of Love confirms, if we needed it, that Danny Wilson is one of the country's most direct, thoughtful lyricists when addressing real human emotions. He's surrounded himself with a band and a style of instrumentation that strikes the listener in the heart with a mix of realism as well as ultimately providing a shoulder for them to rest their weary head on and reassuring them that despite ups and downs that love ultimately triumphs. What Kind Of Love is out now. 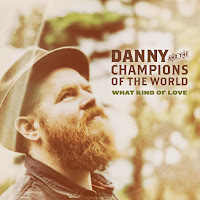 Danny And The Champions Of The World's official website can be found here and they are also on Twitter and Facebook.